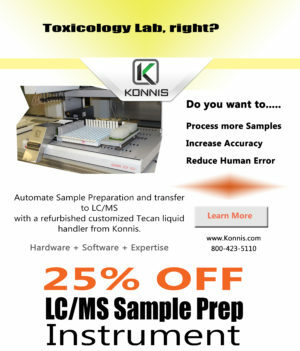 Thank you for your interest in the Konnis liquid handling instrument bundle configured to automate LC/MS Sample Prep. File transfer to LC/MS system – No more manual bar code data entry! Systems are ready to ship now, order yours today! The sooner you purchase, the sooner your lab will benefit! Yes, I want 5% off my first PM.No, I am not interested in discounted maintenance.